Another day, another broken promise from President Donald Trump. Warren did just that on Monday, releasing the results of a test that "strongly support the existence of an unadmixed Native American ancestor" six to 10 generations ago. Her charity of choice: the National Indigenous Women's Resource Center, a nonprofit that seeks to protect native women from domestic violence. The president told reporters at the White House on Monday that he never offered to donate the $1 million and dismissed the test results themselves. "Who cares?" he asked rhetorically. If anyone should care, it's Trump. 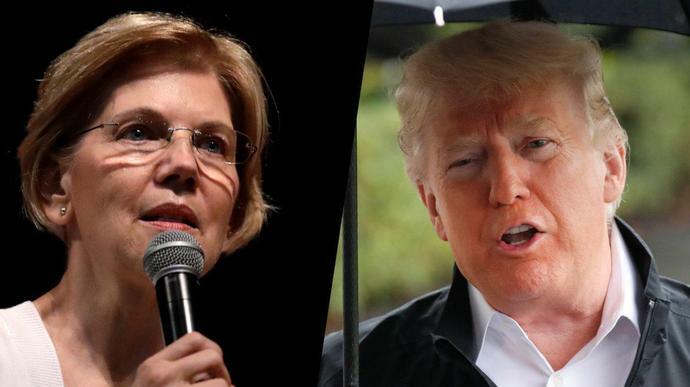 The president has frequently mocked Warren for claiming she has an Native American ancestor and demeaningly has referred to her as "Pocahontas" ― even at an event honoring the efforts of Native Americans in World War II. The National Indigenous Women's Resource Center joins a long list of causes and nonprofits Trump has used as a prop but not contributed to. New York state tax officials opened an investigation into the Trump Foundation in July, accusing Trump of misusing charitable funds for decidedly noncharitable purposes, such as spending $10,000 on a portrait of himself and covering campaign costs.